Lots of growers are discovering the power of LED grow lights. Their cannabis yields are healthy and larger than ever but their electric bill is lower. How can that be? Let’s take a look at the best LED grow lights on the market to show you why. We’ve selected lights for all kinds of grow spaces and growers. 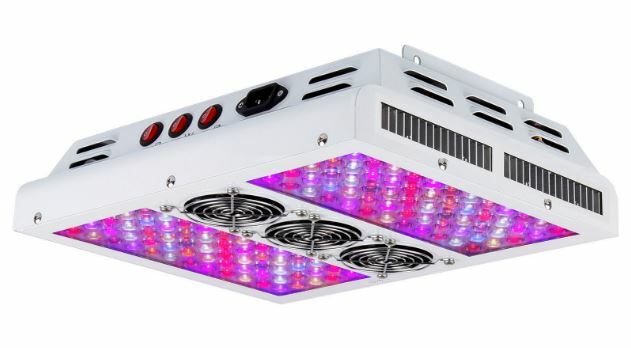 Below you’ll find powerful lights for large grow spaces, lights for small home grows, innovative award winners, supplemental lights, affordable lights for those on a budget and some super-bright Chip On Board (COB) lamps. In case that’s a lot of lights to take in, we’ve added our Top 10 picks to the table below. 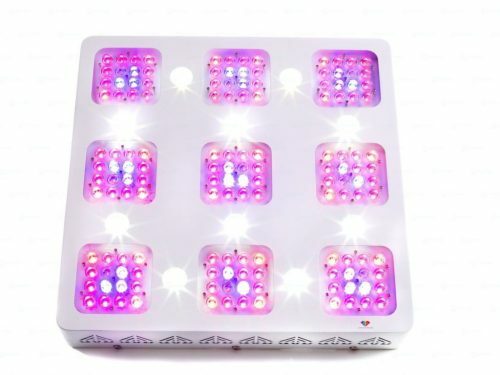 And to help still further, before we get to the reviews, there’s plenty of info on how to select an LED grow light and the specs to look out for. Finally, we show you the basics of how to get started growing some tasty, potent buds with your new light. Enjoy! 3 How much light do you need for your plants? 11 What do you actually need to start growing weed? 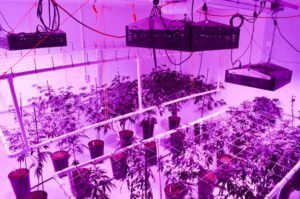 12 Why choose LED lights to grow cannabis? If you want to skip straight to the reviews, just click here. Or use the links in the table. LED (light emitting diode) bulbs use electricity very efficiently compared to HID (high intensity discharge) lamps. LEDs run cooler, don’t need ballast, and don’t wear out for 50,000 hours of use or longer. That means they cost less to run over time. Full spectrum LED light panels are a superior choice for growing cannabis because they mimic real sunlight at a fraction of the cost of running HID lamps. They’re the environmentally friendly choice too. Much less energy consumed and made from fewer or no toxic materials. How much light do you need for your plants? The size of the area you need to cover: A closet, a room, a basement? The intensity you need: Are you sprouting seeds, taking care of plants in the vegetation stage, or trying to maximize flowering? The strain you’re growing: Different strains of cannabis have different light requirements. So before buying a grow lights, check what your chosen strain is going to need. When you’re choosing a grow light, ignore the specs on lumens. Lumen ratings are to measure brightness for human eyes. Pay more attention to specs like PAR and wattage as well as the manufacturer’s guidelines on coverage. PAR stands for photosynthetically active radiation. It’s the light’s intensity as well as what colors it emits. Broad-spectrum bright light will make your cannabis thrive. PAR measures light emitted in the 400nm to 700nm spectrum. That’s from the blue end up through red and into infrared. The higher the PAR number, the more useful the light is for growing. Some LED grow light manufacturers say their panels put out nearly 100% usable light. None of it is wasted by going to heat instead of light like metal halide or high pressure sodium lamps. Most manufacturers say something like their light covers 2.5 feet by 3 feet at a height of 18 inches. When you’re sprouting seeds, you don’t need intense lighting. But when you’re flowering, you will. Pay attention to those specs on area covered because you don’t want to be 8 weeks into growing and realize your light isn’t strong enough to encourage blooming. A panel that might be bright enough when hung two feet above your soil for sprouting a lot of seeds might not cover enough area when lowered down to 12 to 18 inches height for flowering. Buy your panel based on how many plants you want to bloom unless you’re only purchasing just for sprouting. Wattage — How much power does the light draw at the wall? What’s your electric bill going to be? Now let’s review the best LED grow lights for the money. Almost all of these lights are available from Amazon. However, for the select few that aren’t, we recommend (and have linked to) LED Grow Lights Depot. They offer free shipping (orders over $100), discreet packaging, 100% low price guarantee and hassle-free returns up to 90 days. In short, they’re the best dedicated online grow light store we’ve come across so far. The XML350’s coverage is 4.5 feet by 4.5 feet at an 18-inch height, or core bloom at 4 by 4 feet, perfect for semi-compact grow areas like a closet-sized grow tent with one to six plants. This light panel can take the place of a 600w to 800w HPS/MH light, while only using 330 watts of power. More importantly, it has a 11+ spectrum that gives your marijuana plants maximum nutritional value all the way from UV to IR. There are two switches on the panel that control the intensity. 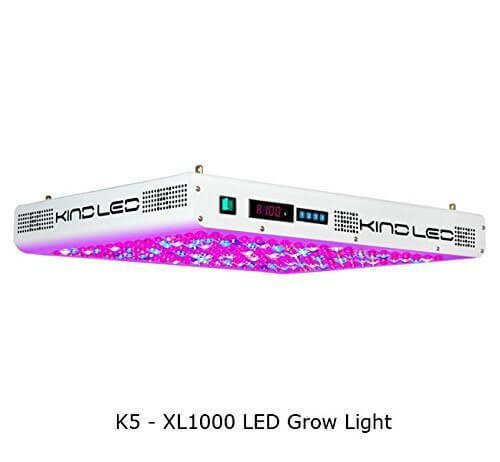 Run it on “Veg” until you’re ready for “Bloom.” You won’t need supplemental lamps to help you flower with the XML 350, or any of the Advanced LED Series. 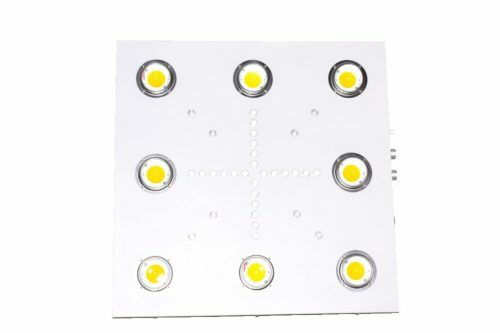 The light chips are 10W CREE LEDs combined with Bridgelux blue and white diodes, and the modules are replaceable, so if one fails you can replace it without losing your whole panel. And if you know your LEDs, you’ll know that these are top bin LED bulbs from the best manufacturers. LEDs sometimes vary in characteristics even though they are made in the same batch. “Top bin” means that the LEDs are matched in color, voltage, and flux. So Advanced LED only uses bulbs that pass strict quality controls. The XML 350 performs extremely well in cloning, vegetative and flowering cycle for all indoor growing areas. Not only are the LEDs top quality, but they come with precision 90 degree collimator lenses to give you optimal coverage. 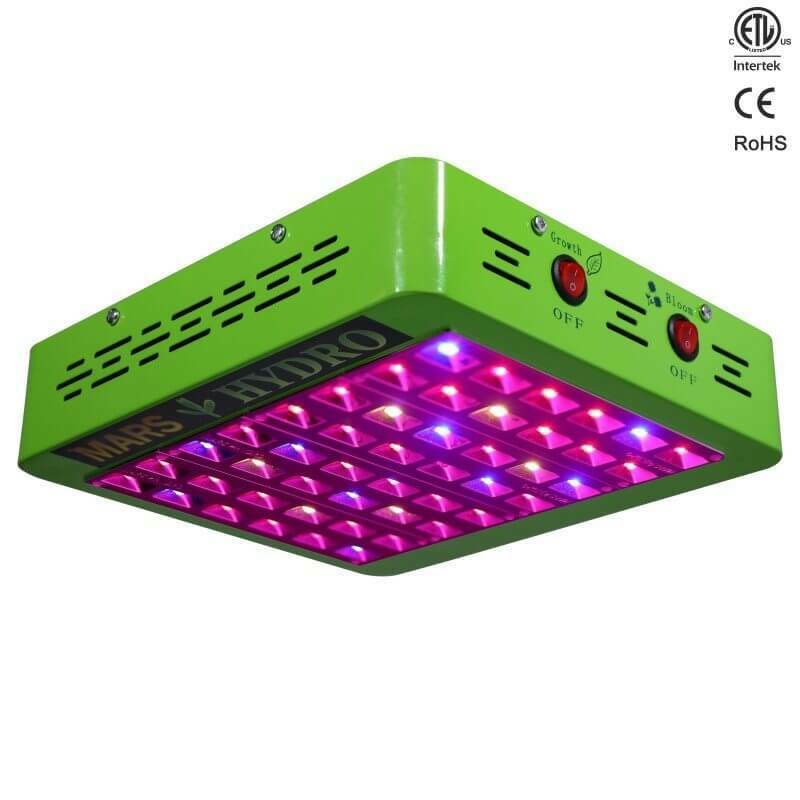 Additionally, a light like this removes the need for A/C in most grow spaces due to very low heat output and can use input voltage AC of 85-264V. At only 18 pounds, the XML 350 is easy to hang in a grow tent or room. The panel itself measures 19.5 inches long by 19.5 inches wide by 3 inches thick. The LEDs should last up to 100,000 hours before burning out, and that’s more than 20 years of 12-hour days! American made, with top quality Bridgelux LED chips, the 100 is the smallest light in Advanced LED’s famous Diamond Series. However, even though it’s small, it still packs a mighty punch, easily replacing a 250W HPS/MH light while drawing only 90W at the wall. It would be ideal if you need to cover a core bloom area of 3 feet by 2.5 feet. That gives you a little more space to work with up to four plants, depending on the strain. All the lights in this series also have a clone setting. They also all come with a 3-year warranty and hassle-free returns policy. The Diamond Series 400 is made to flower plants in an area about 2.5 feet by 4 feet, so you can hit the “Bloom” switch for about 5 to 10 plants. The Veg coverage area at 18 inches is 3 feet by 4.5 feet. The 400 replaces a 600-800W HPS/MH light, but draws only 360W. The Diamond Series 800 is great for more advanced growers with a larger operation. It can replace a 1000-watt HPS light at full intensity and still only use 700 watts of electricity. Its core coverage for bloom at 18 inches above the plants reaches up to 3.5 by 4.5 feet. The veg coverage is 4.5 by 5.5 feet. An adult cannabis takes up at least 1 square foot of space in a 3-gallon pot, so the 800 can flower up to 16 at a time. But before you start imagining the amount of buds you’re going to harvest, better check with your local laws on how much is legal to grow (or try our interactive map). It’s usually a lot less than 16! Spannabis 2017 (Barcelona) award winner for Best Growroom Equipment, this light packs some amazing features into its compact form factor. Prime among them being the fully-programmable spectrum which you can control remotely. Not only that but you can daisy-chain up to 1000 units and control them all with the one remote! What do we mean by fully-programmable? Well, not only can you simulate and automate day and night, you can also mimic sunrise/sunset, even the seasons. You can set programs that last a day, week or season. Moreover, full customizability allows you to tailor the spectrum and schedule to your chosen strain and transition between night/day and veg/bloom with as little stress to plants as possible. As for coverage; the SolarSystem 275 will cover up to 5′ x 5′ and 3′ x 3′ during flowering. 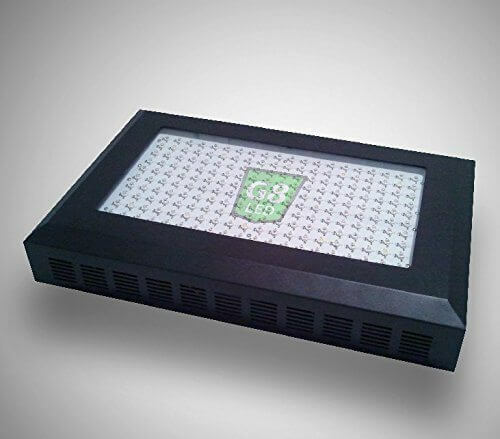 Drawing just 200W, it will replace a 400W HID light, saving you 50% on electricity. Want to know more? 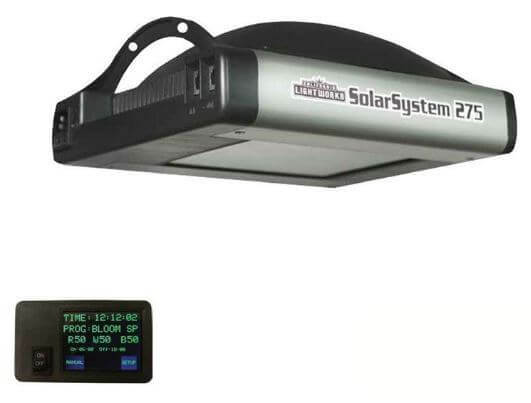 Check out this extremely in-depth review of the full SolarSystem range of lights. Here’s another large and powerful lamp for growers with a lot of area to cover. Winner of HIGH TIMES Magazine’s “Best LED Innovation” award in 2017, this is an epic light with advanced features that will be best appreciated by experienced growers. The Kind K5 XL1000 panel replaces either a 1000-watt or 750-watt HPS (high pressure sodium) setup, but it only consumes 650W of electricity. It’s powerful enough to cover a 5 by 5-foot area for the veg stage, or 4 by 4-foot area for flowering. That’s good enough for 12 to 16 plants. The Kind K5 offers precision control over both the full 12-band spectrum and the light cycles. 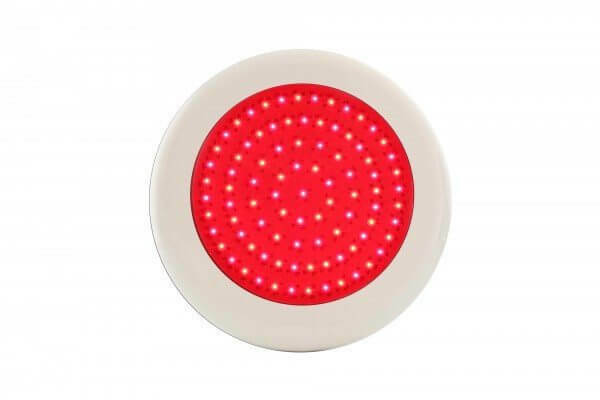 It comes with a remote control allows you to digitally tune the color of the light for any plant growth stage. For example, you can add more red during the flowering stage for bigger blooms. This is a lot more advanced than the simple Veg/Bloom switch on some other LED grow lights. The K5 XL1000 panel also has an integrated timer that allows for eight separate stages of light intensity instead of just a simple on and off. You can program it to imitate a gentle increase of light in the morning, and then a slow decrease of light in the evening just like natural sunshine. The K5 panel is 3 inches tall and measures 26 inches long by 20 inches wide. It weighs a hefty 36 pounds and includes 320 individual LED bulbs. 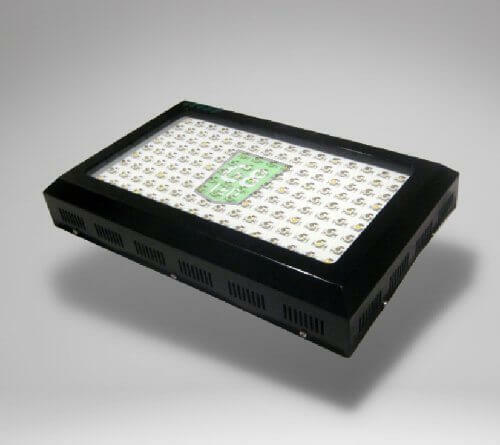 It has both 3W and 5W LEDs with high intensity light that penetrates all the way through the canopy. In the box you’ll find a pair of Method Seven sunglasses. Use them to protect your eyes from damage while you check on your plants. They put the world back in true color and dim down the brightness to acceptable levels. Protective eyewear, why wear it? Have you ever looked into the sun for a few seconds and then looked away and saw spots? Ever heard those stories about someone going blind because they looked too long at the sun? Please protect your eyes while you use a full spectrum LED grow light. The infrared and UV rays can fry your eyes. It may not happen right away; it may take a few weeks or months or even years to happen. Don’t slow cook your eyes, wear glasses or goggles to protect yourself. 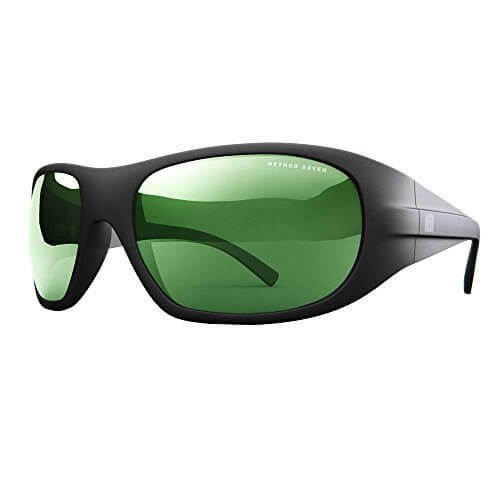 That said, here are some top choices in protective eyewear for using with grow lights. Method Seven makes top of the line grow room glasses. They classify them by light type. These are for protection from LED lights. They also have ones for Metal Halide and HPS lamps. The Method Seven polycarbonate lenses are made by the well-respected Carl Zeiss company. They help your eyes see true color while you test your plants but keep you safe from UV and IR rays. 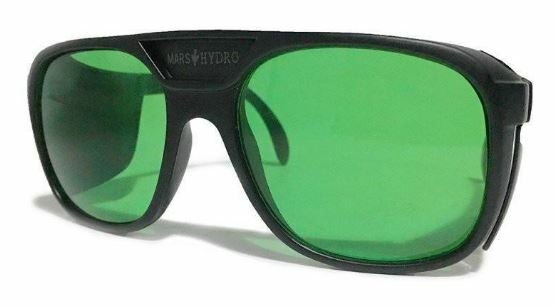 These eyeglasses from Mars Hydro come with a smaller price tag than the Method Seven brand but are still rated to protect you from UV rays and glare under LED and MH, and HPS lights. They’ll also neutralize pink/purple light to give you a more natural looking view of your plants. Now back to our regular programming… more top quality grow lights for marijuana. This time we’re focusing on the budget end of the market. Affordable lights that’ll give you a lot of bang (and perhaps bhang?) for your buck. 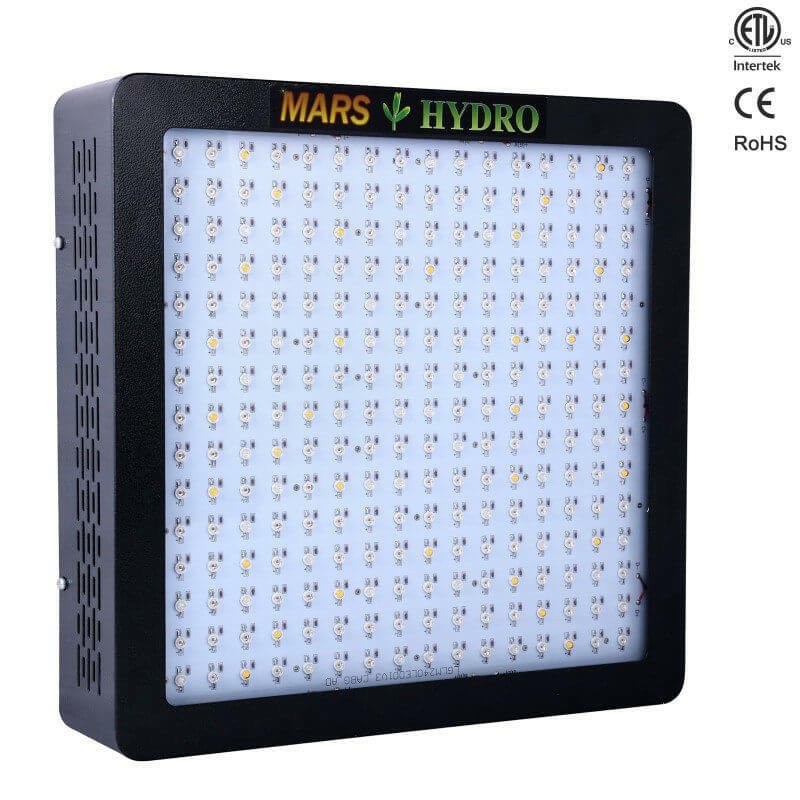 Mars Hydro’s Mars II 1200 replaces a 600W HPS light at around 1/3 of the running costs. It has a sleek and attractive design with a full spectrum of colored top-bin Epistar LEDs and two switches to select between bloom and veg. Meant to be hung between 12 and 30 inches from the tops of your cannabis, it covers a 4 by 4 foot area for blooming. In terms of PAR figures, when hung at 18″ above the canopy, your plants should be getting 1644 umols (micro-moles) at the center of the footprint and around 726umol towards the edge. The lights are rated at 50,000 hours and Mars Hydro covers your investment with a 2-year warranty. Another powerful, efficient Mars Hydro light, but this time at the budget end of their range. 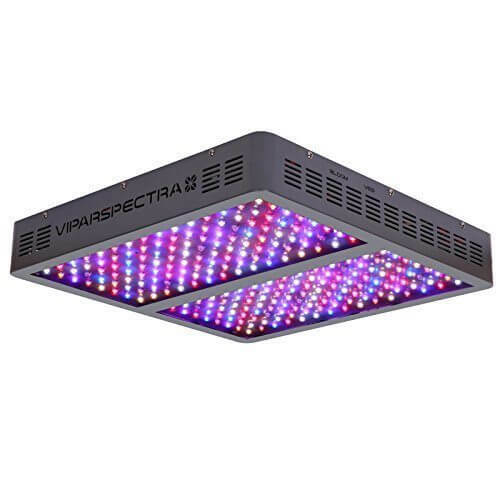 Covering a 2′ x 2′ grow area, this is a full spectrum replacement for a 150W HPS/MH grow light. It gets its intensity and efficiency from a combination of top-bin 5W Epistar LED chips and Mars Hydro’s own custom spectrum diffuser technology. Like the model above, you’ll find two switches for controlling growth stage settings. It also comes with the same 2-year warranty and a 50,000-hour lifespan. 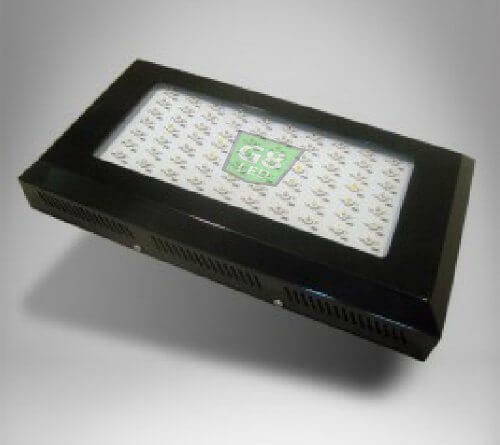 The G8LED 240-watt grow light from DormGrow is the smallest member of the award-winning G8LED family. Its 8-band spectrum works well up to the flowering stage. Then the manufacturer suggests supplementing the panel with a 90-watt Red Flower Booster. This light covers an area measuring 2 by 3 feet. The wavelengths it emits cover the whole range of visible light plus infrared and ultraviolet. If it appears that some of the LEDs aren’t working, it could be because these last two types don’t put out light you can see with your eyes. But if this isn’t large enough for you, try the one below. The G8LED 45-watt light covers all 8 bands of the visible light spectrum plus infrared, making it able to cover up to 12 square feet. 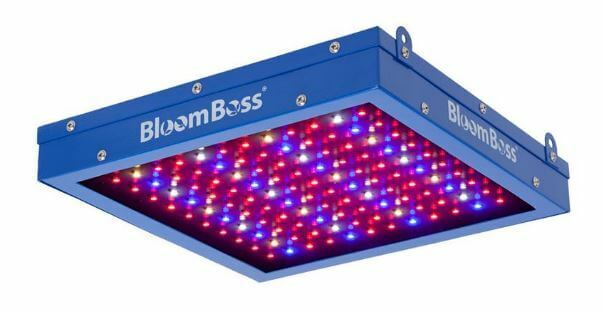 But again, G8LED suggests adding a 90-watt Red Flower Booster for the bloom stage (see short review below). Although we prefer all-in one solutions like the Advanced Platinum Series by PlatinumLED, we respect the opinion of experienced growers. And the G8LED panels were given the award of “Best LED Grow Lights” by HIGH TIMES magazine in both 2016 and 2017 (in the latter case for the bloom only version of the G8LED 600W panel). G8LED has been in business for almost a decade. They offer a 2-year warranty on their lights and have friendly customer service to help you with questions. The award-winning G8LED 600-watt grow light covers a maximum area of 18 square feet for the veg stage. Drawing just 380W at the wall, this is an 800-1000W HID equivalent, so you really get a lot of light for your money! Put it in a 4 by 4 foot grow tent to raise up to 16 plants. And don’t forget your sunglasses, because this baby puts out UV and IR rays. 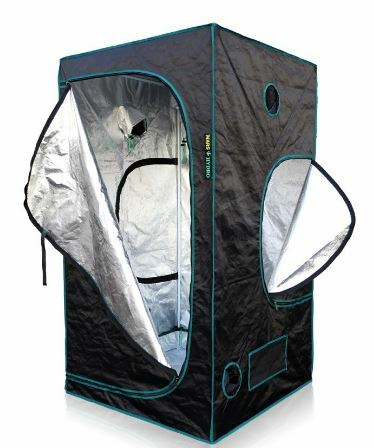 The VIPARSPECTRA 300W would be great in a 2′ by 2′ or 3′ by 3′ grow tent. The core coverage area for bloom is 2 by 2 feet when the panel is hung 2 feet above the foliage. Although it’s rated for putting out 300W of light, this panel actually consumes only 136-watts and can replace a 250-watt HPS lamp. You won’t need any supplemental lights for this panel if you follow the recommendations for how much ground it can cover. It’s one of the lightest weight panels we’ve reviewed up to this point, coming in at just 5.6 pounds. It comes with its own hanging kit and a 6-foot long power cord. If you want to daisy chain this light or use it with a timer, you can. People using the VIPARSPECTRA have commented that it’s very, very bright. This is probably due to the sixty 5-watt Bridgelux and Epileds chips it uses. They are all mounted so their light shines 90-degress straight down on your plants. Their powerful rays penetrate through thick canopy. Other positive comments about this light include the fact that it’s very quiet although it has internal fans to keep its circuitry cool. Plus, it has a good mix of blue and red LEDs to encourage maximum growth. VIPARSPECTRA offers a 30-day money-back satisfaction guarantee as well as a 3-year warranty. If you have more plants to raise, try the 300W model’s big brother. 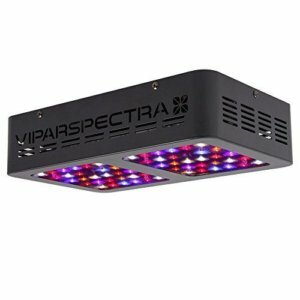 The VIPARSPECTRA 600W will cover up to 9 3-gallon pots at a time. Or invest in the even bigger VIPARSPECTRA 1200W for up to 16 mature cannabis plants at a time. Yep, it’s another Viparspectra light. Viparspectra make some great lights if you’re on a budget. And it seems you guys agree, because like the Reflector Series these lights are great sellers among our readers too. The unique feature of the Viparspectra PAR450 is that it’s dimmable — and pretty affordable too. But what’s so great about being dimmable? Well, adjusting the brightness for different growth stages is arguably a lot simpler than adjusting the hanging height of the light. Moreover, individual control of the red, white and blue channels allows a lot of customization. As for the rest of its specs; this is a full spectrum light that can replace a 400W HPS/MH, while only drawing 210W at the wall. It covers a 3′ x 2.5′ grow area during bloom and 3.5′ x 3′ max. Viparspectra offers a 3-year warranty and 30-day satisfaction or return guarantee. Big brother to the VIPARSPECTRA PAR450, the PAR600 is an even bigger hit with our readers. From this model, you can expect a max coverage of 4 x 4 feet and core coverage of 3 x 3 feet when hung at 24 inches, for a power draw of just 285W. This one only has switches, though, rather than dimmers. The full spectrum BloomBoss PowerPanel only covers a small grow area, 2′ x 2′ at a distance of 6-18″Â — but it draws just 32W to do so! And that’s why we’ve included it here — it’s cool, silent and super efficient. 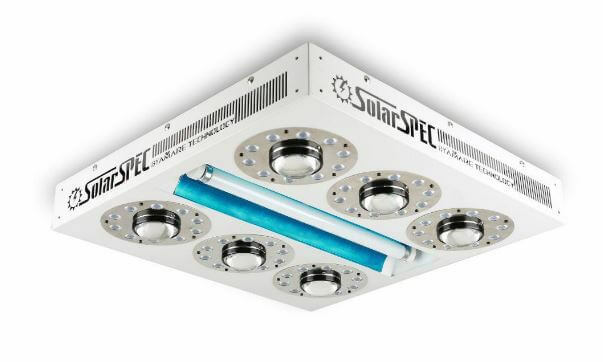 More of an alternative to fluorescent T5s (96W equivalent), rather than HPS or MH lights, this is best suited for clones and seedlings and also makes a great supplemental light to round out the spectrum and increase your yields. A 50,000-hour+ lifespan and 5-year warranty with lifetime tech support don’t hurt either. Top-end components at an affordable price make Unit Farm’s UFO range of lights worth a mention here. Just like the rest of the range, the UFO-80 boasts high-output, highly efficient, ultra-reliable LED chips from top manufacturers Cree and Osram. In practical terms, that means this full spectrum unit can comfortably cover a 2.4′ x 2.9′ grow area during flowering, while drawing only around 175W. And provides 1469.2umol of PAR at the center of its footprint. Veg and Flower modes are controllable by two separate switches. Warranty is 3 years and the LEDs are rated at 50,000 hours. Have you ever heard of COB LEDs? This is a light made up of multiple chips packaged together. The COB LED “bulb” looks small but it can put out a lot more light than regular LEDs taking up the same amount of space. COB LEDs are probably the wave of the future. They rarely fail because they have fewer soldered joints and they run even cooler than normal LED panels. Their viewing angle is wider than many traditional LEDs (which are 90-degrees) and some don’t even need lenses to create this effect. You may have heard of some brands that are using COB LEDs now, like Bridgelux’s Vero and Cree’s CXA to achieve amazing canopy penetration and intensity. Amare is using CREE CXB3070 COBs (the supplemental chips are CREEs too) and earning an increasingly good reputation for their range of SolarECLIPSE grow lights. Hung at 24″, this will cover a 4′ x 4′ grow area during flowering, with a power consumption of 500W. It has a switch for selecting between Grow and Bloom modes. And with the removable lenses installed Amare claims the SE 500 can surpass natural noon sunlight, emiting 2118umol/sec/m2 hung at 24″! 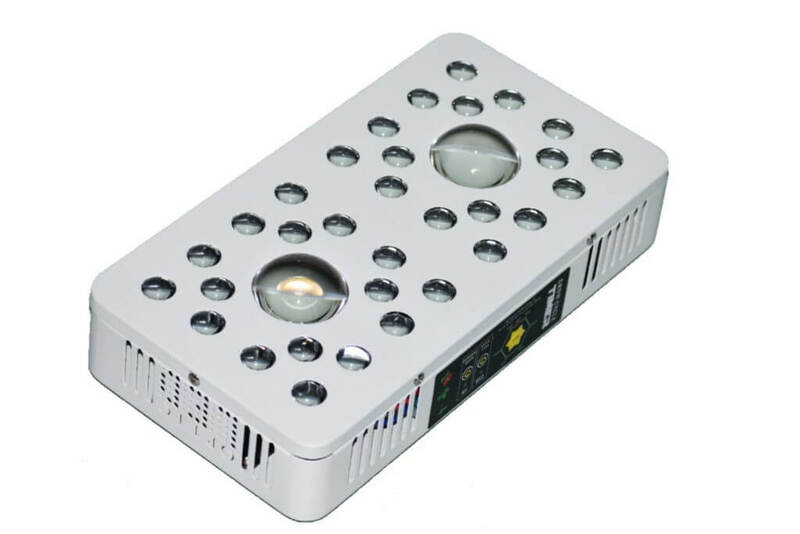 The Optic LED Optic 2 grow light is tiny but mighty. 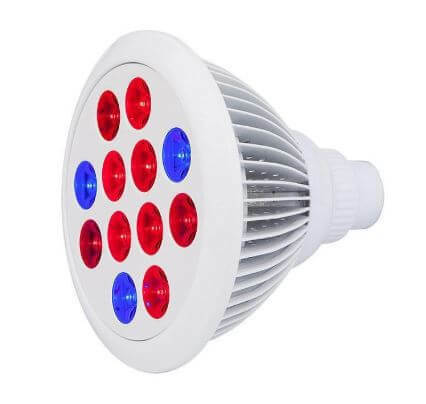 Its two 50W CREE chip-on-board arrays , supplemental Bridgelux/Epistar chips and intensifying secondary lenses, focus an impressively rounded spectrum of UV, blue, red, green and IR light onto your plants for maximum growth with minimum power use. While it’s rated for 400W, it consumes only just over half that in electricity. It also runs very cool. Those two things will help you keep your pot farm on the down low. Coverage-wise, it’s good for 2′ x 3′ during flowering and 3′ x 4′ during vegging. Click on the button above to see the detailed spectrum and PAR charts. We’re also impressed by the 5-year warranty and a built-in 6-stage timer, both great additions for a light at this price. Optic LED’s Optic 2 is impressive, but its big brother the Optic 8+ is an absolute monster. Thanks to industry leading components throughout, Optic LED reckon you can expect a yield of up to 2.5 pounds from one of these(! ), which with a draw of 500W comes in at 2.25 grams per watt. Super efficient. The recommended grow area? 4′ x 4′ during flowering, with the light hung at 30″. Again, just click the link to check out the PAR values. Other features: 3 independent dimmers (Veg controls 4 COBs, Bloom controls another 4, and Bloom Enhancer controls the supplemental LEDs), and 2 switches (1 for all 8 COBs, the other for the supplementals). No built-in timer for this model… but really, who cares?! Let’s say you are trying an experiment. You want to grow just one cannabis plant to see how it goes. 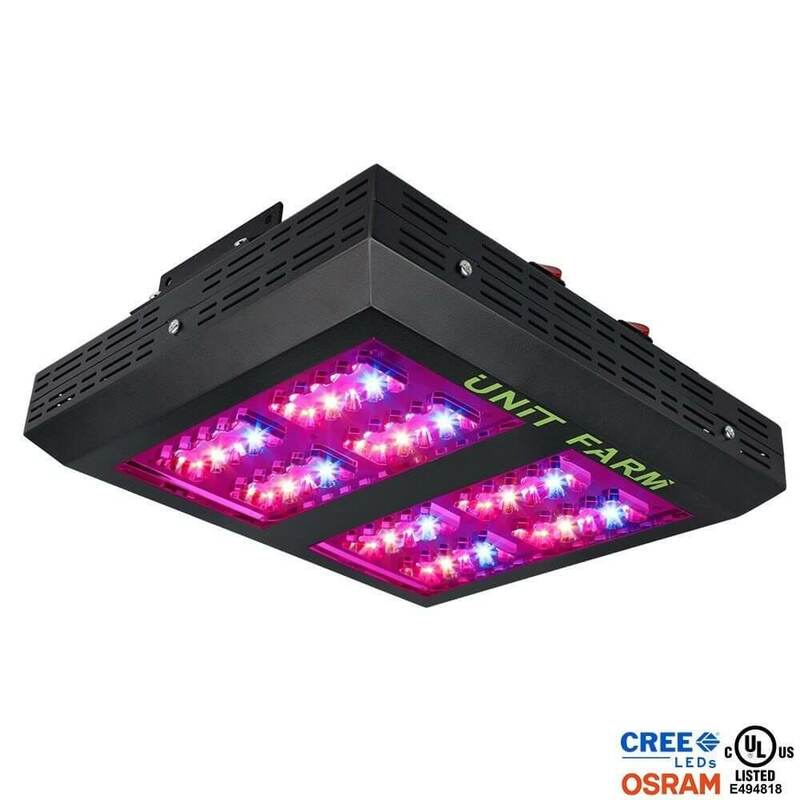 Instead of investing a couple hundred dollars or more on a nice LED panel, why not try this small grow light from Cirrus LED Systems? It’s got red, it’s got blue, it will help your little plant grow to harvest time all by itself. Screw it into a light socket or a desk lamp (anything with an E27 fitting), just keep it within 18-inches from the top of your plant. Or use two for even better results. Draws 24 watts at the wall. Let’s say you want a larger crop but you’re already stretching the light from your LED panel to the limit. Many growers supplement with an extra red light or two at the flowering stage. Well, this is the extra lamp we mentioned earlier for some of the LED lights that need it, like the G8LED panels. In fact, it’s also produced by G8LED. Just add one or more of these 90-watters (actual draw 82W) in at flowering time to get more buds and flowers and maximize your yield. Hang it above or below your main light, or angle it, whatever you prefer, so long as it’s at least 12″ from your plants. Lasts 50,000 hours and comes with a 2-year warranty. Besides a powerful and reliable LED light, you need other accessories for growing your weed. Here are some of our recommendations to make raising cannabis easier. Although you’ll be running cool with an LED light, it’s still a good idea to keep an eye on the temperature and humidity in your grow tent. This one has a large, easy to read display and runs off one AAA battery. Why bother with a grow tent if you’ve already got an empty closet? Well, a grow tent serves multiple purposes. Quick and easy to assemble, this tent from Mars Hydro is good for a beginning grower. And it works especially well in combination one of Mars Hydro’s own LED grow lights (see above), the reflective lining having been selected for and tested with their own range. Comes in a number of different sizes. The right nutrients will encourage your weed to grow big and strong with good tasting buds. 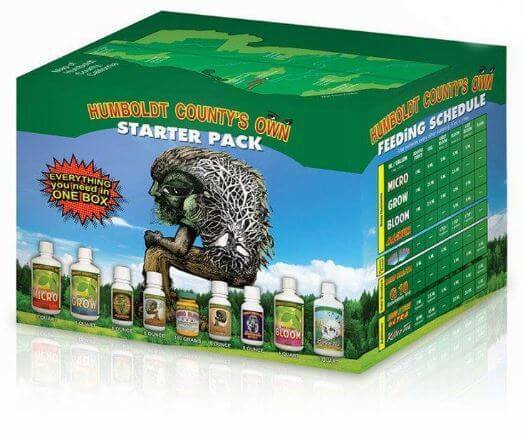 Humboldt County’s Own has a proven track record with their cannabis growing nutrient range. Not only that, but this is also the only starter pack on the market that comes with full size bottles rather than little sampler containers. Buy this and you can be sure you’re not going to run out mid-grow. 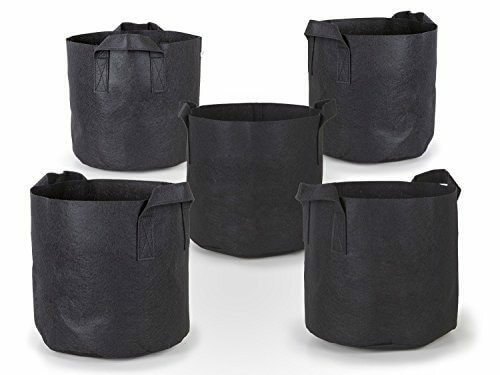 If you don’t plan to move your plants around a lot, these 3-gallon grow bags are an economical way to raise cannabis. Although three gallons sounds like a lot, they measure just 9 inches high and 10 inches across. They’re permeable, so water passes through. Consider resting them on a waterproof base. 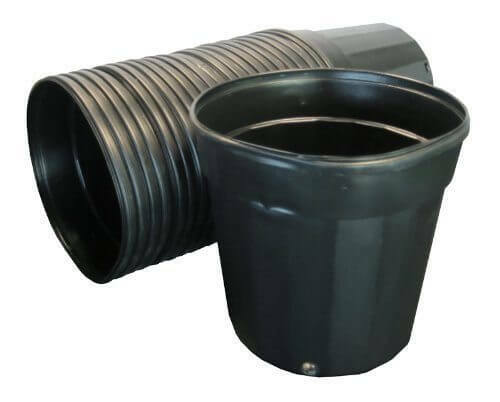 Another way to grow weed is in these plastic pots. They stack together when you’re in between growing sessions. 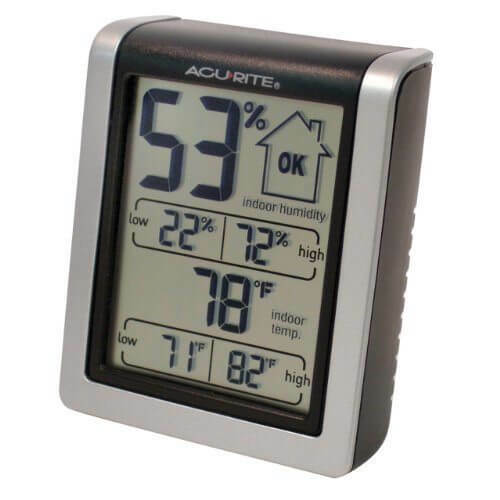 If you’re not sure when it’s time to water, this hygrometer will help you know. Ready to sprout some seeds? 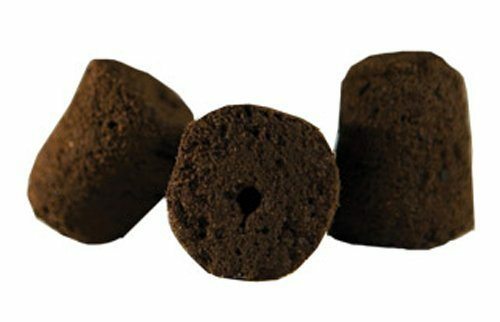 Here are some starter plugs that are packed with nutrients to explode root growth. Just pop the whole thing into the soil in your pots once they start showing leaves. We couldn’t resist this educational kit! It comes with tray and peat pellets plus instructions. What do you actually need to start growing weed? Although we have a beginner’s guide, here is a quick overview. When you decide to grow weed for the first time, consider your goals and your budget. If you’re just experimenting, you may not want to invest in a big LED light, a grow tent, and so forth. On the other hand, if you’re planning on making a living from growing or at least raising your own crops regularly, it’s worth it to spend more right at the start. Buy seeds from a reputable place. There are some growers in the Netherlands that offer a large variety of strains to choose from. Check to be sure they look tiger-striped and aren’t black. If you’re buying clones, be sure they’ve been sexed first. If you’re raising from seeds, take some time to learn about sexing plants. With cannabis it’s important to be able to tell males from females because females are the ones that produce the right kind of buds for smoking and so forth. As for a grow tent, it’s really nice to have. We mentioned some reasons why above. At the minimum, keep your un-tented grow space protected from weather, from pests, and from temperature swings. Paint the walls bright white if you can so they reflect as much light as possible back onto the plants. 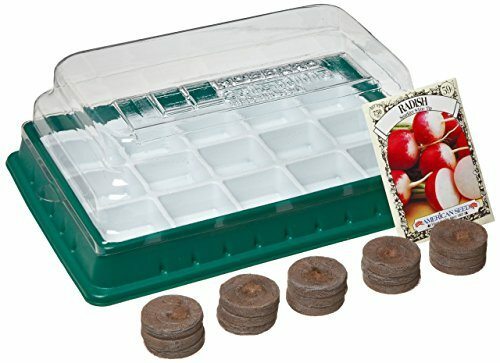 If you keep costs as low as possible, you can probably purchase seeds and all the accessories you need (or repurpose ones you have at home) to raise up to 4 plants for $100 to $200 dollars. But in reality, if you plan to keep growing, invest at least twice that much to start in order to get the best stuff you can to begin. You won’t be nearly as frustrated if you have a reliable light, a sturdy grow tent, and a way to measure conditions like temperature, humidity, and soil moisture. Check out this time lapse video of cannabis growing to get a feel for how it looks to grow weed. Why choose LED lights to grow cannabis? In summary, LED lights run cooler and use less electricity to get better results (in many cases) than high pressure sodium and metal halide lamps. You don’t need extra fans or ballasts. The LEDs themselves last for years before they need replacing even if you run them for 24 hours a day. When you’re shopping for a grow light, whether it’s for your first time raising marijuana or an upgrade to a light you already have, you need to decide just two things. How much light do you need? As in how many plants are you planning to grow? And are you raising them from seedling to harvest under the same lamp? What’s your budget? If you’re upgrading from an HID setup, the cost of an LED grow light might seem high until you figure in that you’ll save money on electricity and cooling and maintenance. If you’re experimenting with only one plant, even a small 100W grow lamp will probably work for you. You can always add a supplemental red lamp with IR for bloom time. If you have a grow tent big enough for two plants to four plants, you’ll need at least 200W. From four plants up to six, take a look at the 300W to 450W range. Anything more than 6 plants and two things happen: one, make sure your local laws allow you to raise this much, and two, consider getting two panels and daisy-chaining them. This is simply connecting them to each other with their power cords so you can control them with the same timer. Some brands will let you do this while others will advise you against it. A final thing to consider is the strain of cannabis you’re growing. Some strains grow larger than others and will need more space. They may have leafier canopies and so they will need a more powerful light to penetrate their foliage. Fortunately, LED lights are very unlikely to burn the leaves of your cannabis. The heat from high pressure sodium and metal halide lamps is a danger to plants if you place the light too close to them. But LED panels are cool, and you can touch the bulbs themselves with your bare hand and not even burn yourself. If you’re worried about burning your plants, watch the leaves. If you see yellow or brown spots and the serrated edges curl upward, your plants may be getting too much heat from their lamp. There are other signs to watch out for as you grow weed. For example, overwatering is a common problem for new growers. It helps to have a hygrometer to tell you if the soil is dry enough. If you’ve given your plants too much water, you’ll see their leaves drooping and curling down toward their stems. If this continues to be a problem, make sure you have good drainage for their pots and try poking some holes (gently) into their soil to aerate them. If you’re using pre-made nutrients to fertilize your weed, watch out that you don’t overfeed them. If they get too much, they will develop random spots and their edges may curl downward. If this happens, try watering them with pure water (not tap water) and cut back on nutrients for a while. Beginning growers may not want to worry about testing their water and soil for pH levels, but having the right amount of alkalinity will help your weed flourish. The ideal is to hit between 6.0 and 7.0. One trick to help you achieve that is to avoid watering with tap water, or else fill a container with tap water and leave it out overnight to help de-chlorinate it. 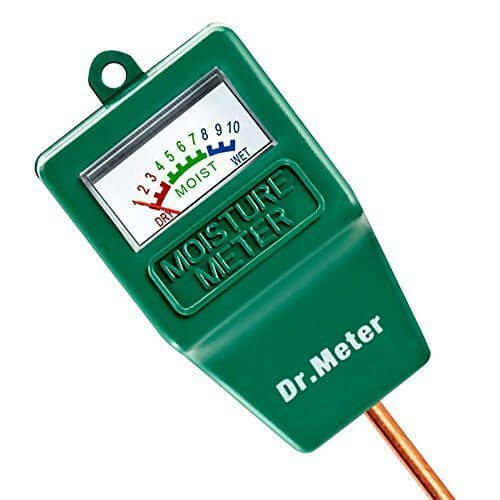 To check your work, use a pH tester kit like this one from General Hydroponics. Sorry guys, male plants are less desirable than females. If you buy seeds from a reputable dealer, they should be for female plants already. But keep an eye out in case someone screwed up. Once your plants have been flowering for about a week to ten days, their gender will become obvious. The easy way to tell the boys from the girls is this: boys grow, ahem, bananas, and girls grow hairs. Male plants look, well, male. Female plants have white hairs that sprout. Separate out the males before their bananas, or pollen sacs, erupt and pollinate your females. That way the psychoactive elements of your female plants stay pure and powerful. If you’ve grown attached to your plants, you can avoid tossing them out after harvest time. Just leave about a tenth of the plant’s stem, branches, leaves, and buds intact. Don’t trim everything down to the nub. Pull it out of the soil and trim off brown roots, then transplant the plant into a fresh pot of soil with fertilizer. Go back to watering and leave the lights on for up to 20 hours a day. Within a couple of weeks you should see new growth happening. Happy growing! Check back soon for more reviews of the best products for raising a bumper crop of weed! 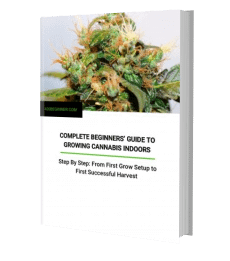 Very detailed and helpful info for led grow lights, thanks, and congratulations! I used to grow a long while back using HID lights on and ebb and flow system. 18 hours on 6 off. During those 6 off I used a Co2 unit that release 50 cfm every 1.5 hours starting immediately at lights out. I didn’t see anything in this article about that And am looking to start up again….any suggestions? Ut seems there has been leaps and bounds made in my down time. Plants need CO2 when photosentizing. At night it normally breath oxygen like any other living thing. This light may be enough for four plants. Each plant requires about 1 square foot of space and about 25 watts of actual (not rated) power. you have 4 square feet and about 90 watts of actual power so you are just at the upper limit of what you can use for growing. 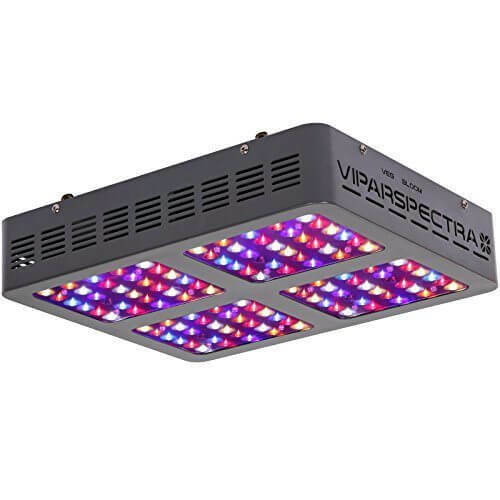 That said if you are expanding, you should think about giving your plants more room and more light than you currently have and the best option would be using another 300 watt viparspectra and maybe a large grow space. Yes, we have reviews of the Mars products. Did you know you can buy them cheaper on Amazon sometimes? Check our reviews.